ENTERTAINMENT YOUR GUESTS WILL RAVE ABOUT. You have an event to plan. Let's check ENTERTAINMENT off your to-do list. commanding stages for 10-2000+ guests. Reinvent what your guests imagine when they hear the word magic. Mentalist Daniel Jaspersen provides highly engaging and thought-provoking entertainment for today’s professional adult audiences. An unforgettable evening that leaves you looking like the ultimate event planner? Absolutely. Daniel’s smart but light-hearted performance style is not your Uncle Chuck’s magic. He doesn’t do silk flowers or top hats either. This is magic for an audience ready to engage their imaginations. 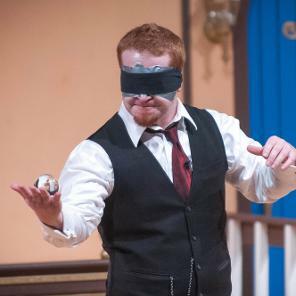 Magician@Play provides pro-grade entertainment for audiences that think. Customized Presentations to communicate your message magically. Step 1: Tell us about your event through our simple BOOKING form. Step 2: Our team will review your request and email or call you back. Step 3: Together, we'll determine the best mix of our services for your event. Booking entertainment you know your party will love can be challenging. We’re experts at creating a buzz during events that your audience will rave about for a long time.